Applying for a Chinese visa can be tricky. Add in your kid's application and it gets even trickier. By all accounts, the Chinese Embassy scrutinizes application forms very closely, and anything from filling out the form by hand to having an occupation that's even vaguely eyebrow-raising (I got called out for being a copy editor) can get you brought in for an interview or even rejected. What's more, the online instructions can be confusing, particularly when it comes out to applying for children under 18. After going through the process, here's my advice on how to go about applying for Chinese visas for your family. Note that these instructions are only for American citizens with American passports. 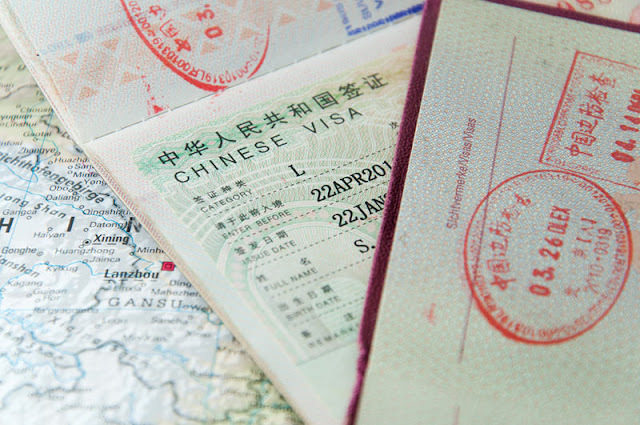 Chinese visa applications can't be submitted online or by mail. You or someone on your behalf (either a friend or visa agent) must apply in person. Here's a list of all the Chinese embassies and consulates in the United States. Consider using a visa agent. I'm all about DIY and would've applied for the visas at the embassy myself, but a friend advised that I use a visa agent who can navigate the system better, and I'm glad I took her advice. The visa agent looked over my application, pointed out a couple of things that needed to be changed (like how my application should be typed in all caps), noted some things that I was missing, and saved me tons of time and headache. Plus, I didn't have to wait on the line at the embassy. Apply for your visa one to two months before your departure date. If you apply too early, your visa may be invalid by the time your trip starts (it must be used within 90 days of issue). If you apply too late, you run the risk of not receiving the visa in time. While most visa applications are turned around within a week, there's always the possibility that your application will raise a red flag (for example, if you work in the media or for the government) and require longer to process. * If only one parent is bringing the kid on the trip, you'll need to supply an authenticated letter of authorization from the parent not going, declaring that he or she consents to the visa application and for the other parent to travel with the minor. Here is the application and below are the rules. Don't take them lightly! * The form must be completed on a computer and printed. No handwritten applications will be accepted. Type in all caps. * The photo can be glued, stapled, or taped onto the application. Make sure the size is correct (it's different from the passport photo size). The rules for how the photo looks are very strict — you can be rejected for having the wrong color background or tilting your head the wrong way. Here's more on how to get the photo exactly right. * Any time you encounter a field on the form that doesn't apply to you, enter "N/A" instead of leaving it blank. * Clip the pages of the application together using a paper clip; don't staple. * Here's a sample pre-filled application. 1.9 - This line asks for your local ID or citizenship number. It's NOT asking for your social security number. You can enter your driver's license number here or write in N/A if you don't have one. 1.17 - For children, fill in N/A. For adults, be careful about how you list your occupation. I originally filled in "copy editor," but was told by my visa agent that the consulate is concerned about anyone who works in media or publishing, particularly journalists. Also, anyone who works for the government or a religious organization may get flagged. She advised me to fill in "housewife" instead, which is technically also true! Also, if you checked off "self-employed" in section 1.15, don't leave this section blank even though you don't have a full-time employer. The embassy wants to know all about the line of work you're in. 2.1 - Check off "tourism" as the major purpose of your visit, unless you are going for work, in which case, check off "Business & Trade." 2.2 - For the intended number of entries, here's a pro-tip. Check off the last box for "Other" and fill in "10-Year Visa." This will get you a visa that's valid for the maximum amount of time of 10 years. It doesn't cost you anything extra and the application process is exactly the same. You might as well get your money's worth! 2.6 - The information here should match the proof of travel that you're providing. 2.8 - Only complete this section if you're staying with someone who lives in China for your visit. Otherwise, fill in N/A. Part 5: Fill in this section if the application is for your child.